Former CDC Head Tom Frieden Aims At Cardiovascular Disease And Epidemics In $225 Million Venture : Goats and Soda The former head of the Centers for Disease Control has $225 million for his global health group Resolve, which will aim to prevent stroke and cardiovascular disease as well as epidemics. Dr. Tom Frieden met with staff from Doctors Without Borders during a visit to the group's Ebola treatment center in Monrovia, Liberia. 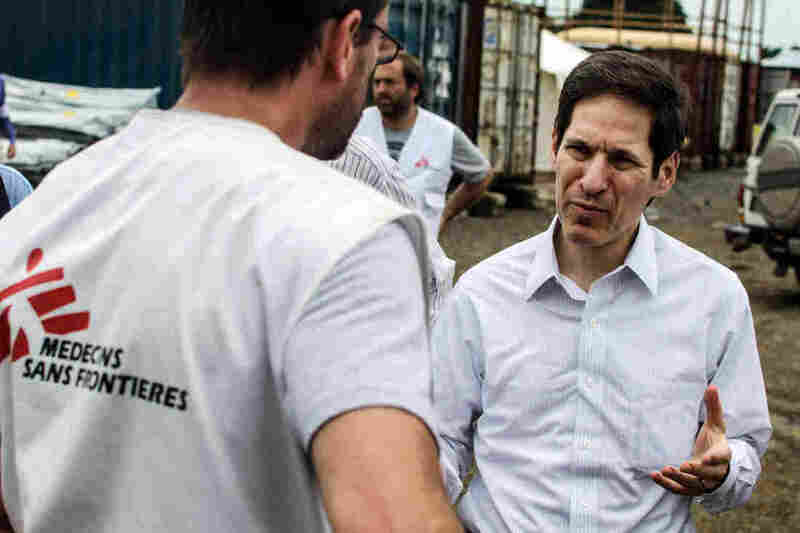 Dr. Tom Frieden, who led the Centers for Disease Control and Prevention (CDC) from 2009 to 2017, has a brand-new job as head of a brand-new global health initiative called Resolve. At CDC, Frieden faced such global threats as the Ebola epidemic and the H1N1 flu pandemic. As a political appointee, he submitted his resignation to President Trump in January. Prior to his CDC stint, Frieden was Commissioner of Health for New York City under then-Mayor Michael Bloomberg; Frieden ran an anti-tobacco initiative that reduced the city's smoking rate by a third. Frieden's new organization — funded by $225 million donated by Bloomberg Philanthropies, the Chan Zuckerberg Initiative and the Bill and Melinda Gates Foundation — has a double focus: to reduce and prevent heart disease and stroke, and to increase worldwide preparedness for fighting epidemics. We interviewed Frieden by telephone from New York, where his new office will be located, housed at the global public health organization, Vital Strategies. The conversation has been edited for length and clarity. The Gates Foundation, as our readers may know, is a funder of NPR. Heart disease and epidemics don't usually go together. Why focus on these two areas? When I was leading the CDC, I asked, what can I do to save the most lives? And so [when this opportunity came up] I looked at what could make a big difference. I identified two issues: cardiovascular disease prevention and the prevention of epidemics. Stroke and heart disease kill 10 million people a year. Currently only 14 percent of people in the world have [cardiovascular disease] under control. If we can, ideally get that up to 50 percent and reduce sodium [consumption] by 30 percent, and also eliminate artificial trans fats from food, that will [over the years] save lives. For epidemic prevention, there are gaps in preparedness that need to be filled. You need to have a system in place all the time and that you can ramp up when needed. The components are what I call the "Core Four": tracking systems, or surveillance systems, so you know what is happening; laboratory networks so you can identify the [microbes]; trained public health physicians; and rapid response teams that can surge in when there is a problem and fix it. The connection between the two initiatives is that strengthening public health systems is at the core for each. We'll work in partnership with governments and organizations. Any specifics about how to accomplish those goals? For hypertension: You come up with a simple protocol [using medicine] that can be used in even remote health posts all over the world and train health workers to use that protocol, make sure that the medicines are in place and to put an information system in place [to track it], system. For sodium reduction, that's about reducing processed and restaurant food [with large sodium content] and encouraging people to add less in their cooking and at the table. For trans fat, which is a toxic chemical artificially produced, it's getting it out of the diet. For that you would have to convince governments to step in. For the prevention of epidemics: You fill gaps in preparedness that have been identified. There is an excellent process that WHO coordinates called the Joint External Evaluation Process that has identified life-threatening gaps in preparedness. Now the challenge is to close those gaps. That means providing technical assistance as well as catalyzing funding from governments and organizations. Speaking of epidemics, what did you learn from the Ebola crisis? Ebola was a wake-up call for the world. It showed, again, if there is any area that is not prepared, then all areas are potentially at risk. Ebola was an epidemic that did not have to happen. What is less known is that it was very close to being catastrophic after a cluster of cases [occurred] in Lagos. If it had gotten out of control in Lagos, the odds were that it would have gotten out of control in Nigeria and elsewhere and that would have resulted in millions of deaths. And it was in touch and go in Lagos until the polio eradication team of Nigerian physicians and public health workers trained by CDC snapped into place there. That shows the importance of the "Core Four." We don't know what or where the next emerging threat will come from or when, and we need to be prepared for this. One of the key lessons not just from Ebola but from anthrax and other emergencies is that what we need is not some fancy system but a system that you can have in place all the time and ramp up when needed. What are you most excited about as you launch Resolve? Having worked in government [and with its bureaucracy for] more than 25 years and now in the not-for-profit area, it's a delight to say, Do you want to start today? Let's start today. Speed is really of the essence, to get to work immediately.